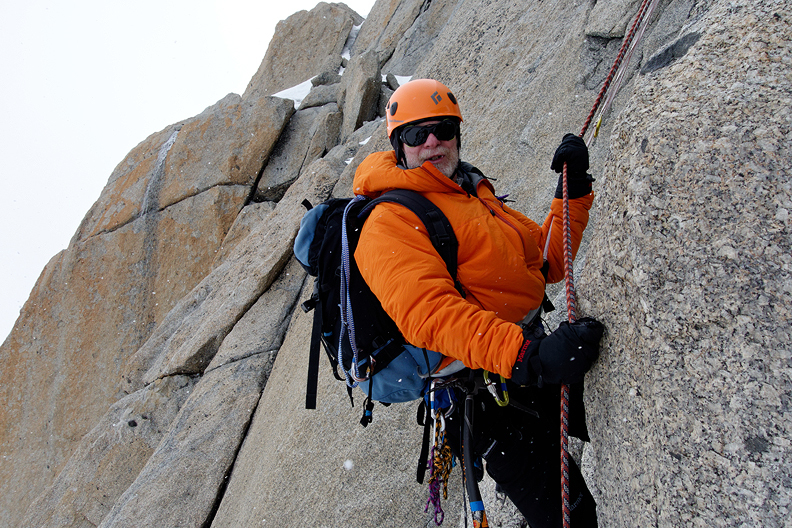 Norm Numerof once again joined Mark for a week's worth of climbing in the Chamonix area. Unfortunately, the weather proved to be anything but stable. 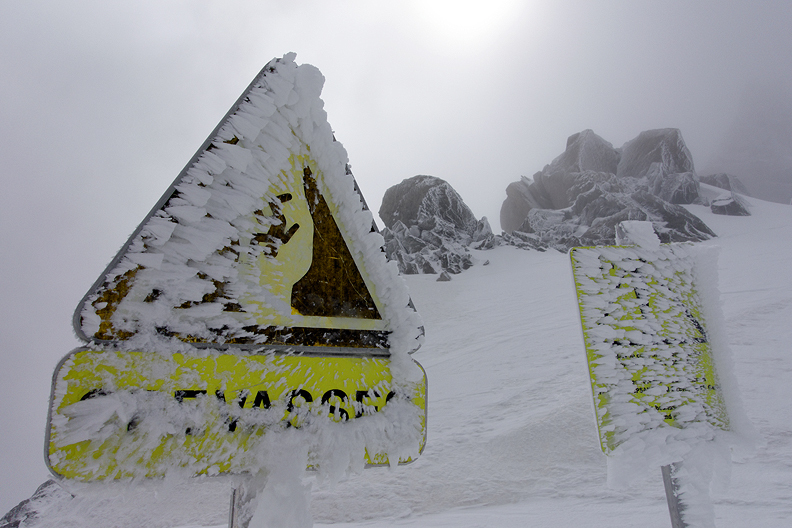 The forecast called for a major "degradation" the evening of our first day, with some 20 to 30 cm of new snow to fall. This more or less set the tone for the next 6 days, though we did have a bit of sun on a few of our climbs. 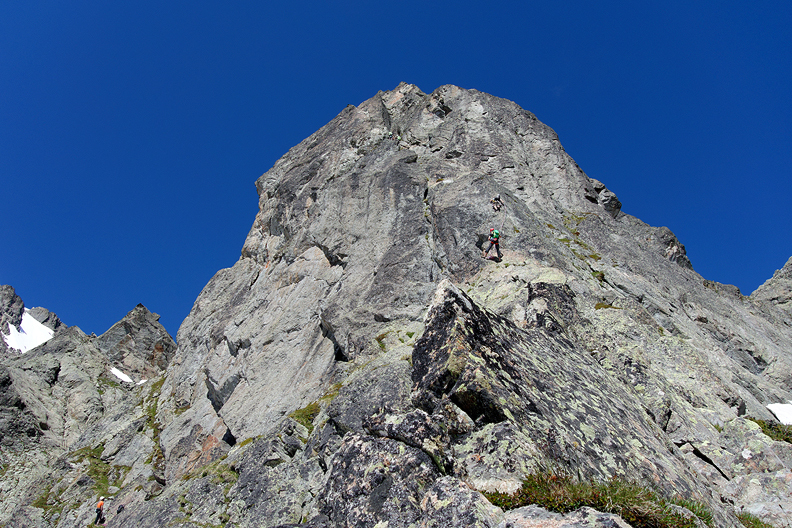 Though we certainly had our share of "discretion is the better part of valor", we also managed a few good climbs. 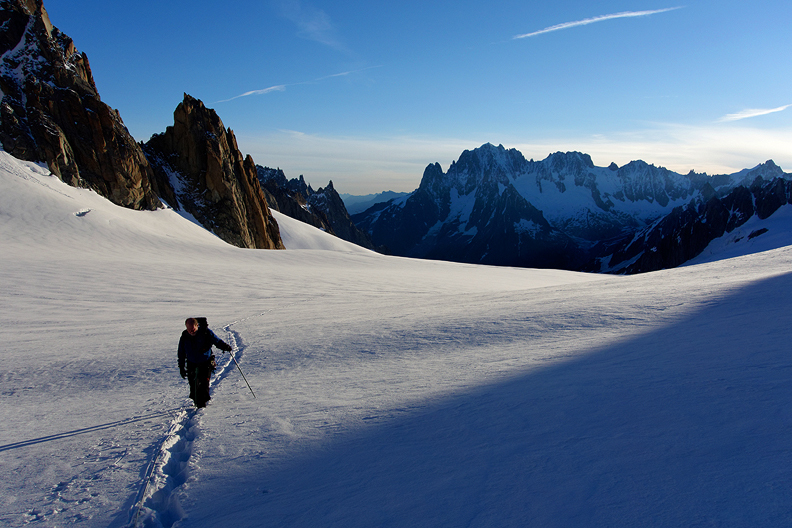 On our first day, we took advantage of the morning's not-too-horrendous weather to climb the Chèré Couloir on the North Face Triangle of Mont Blanc du Tacul. 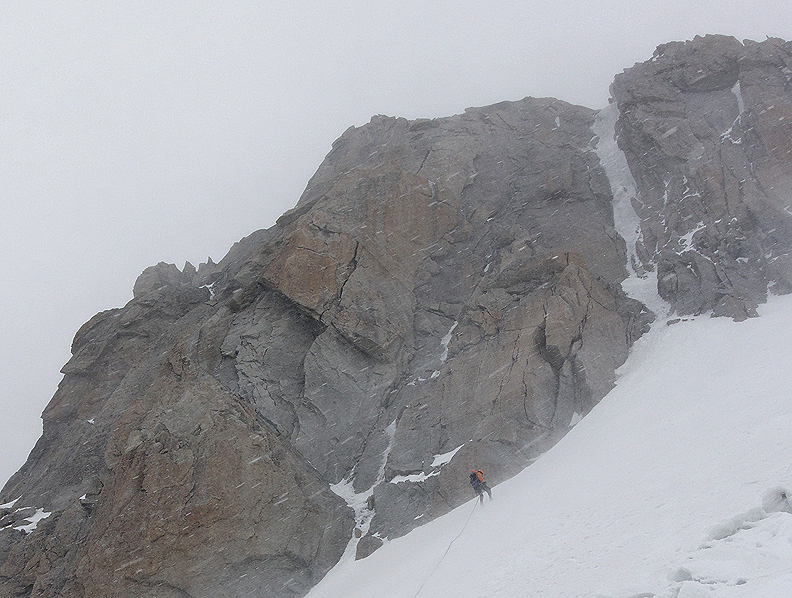 The rising winds and predicted afternoon snow suggested a rappel descent of the route. 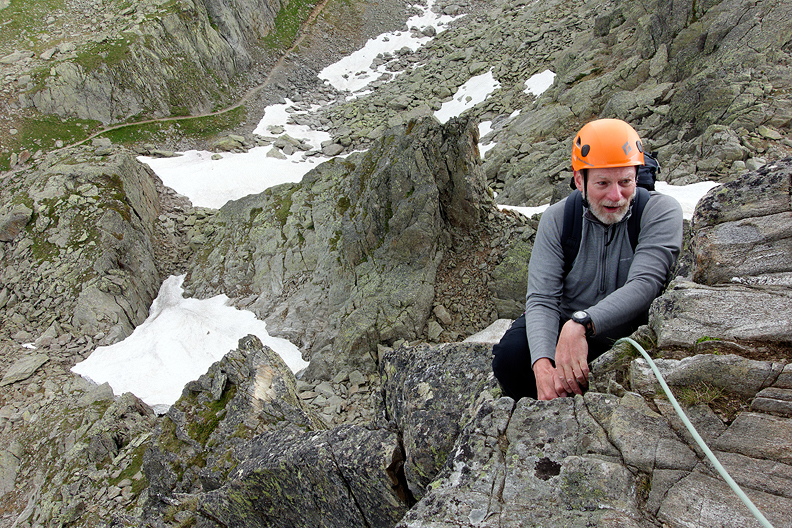 Norm on the last pitch of the Chèré Couloir. The last rappel. 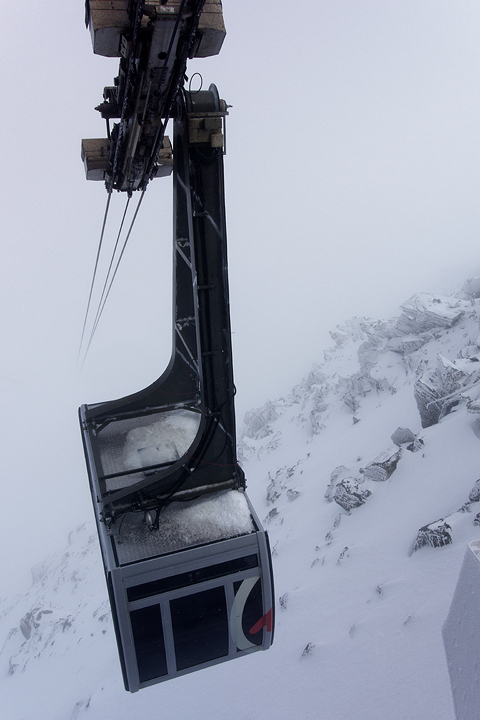 The wind is whipping up lots of old snow and a few new flakes. The weather was truly dismal for day 2, which we took off. However, things were forecast to slowly improve on day 3. 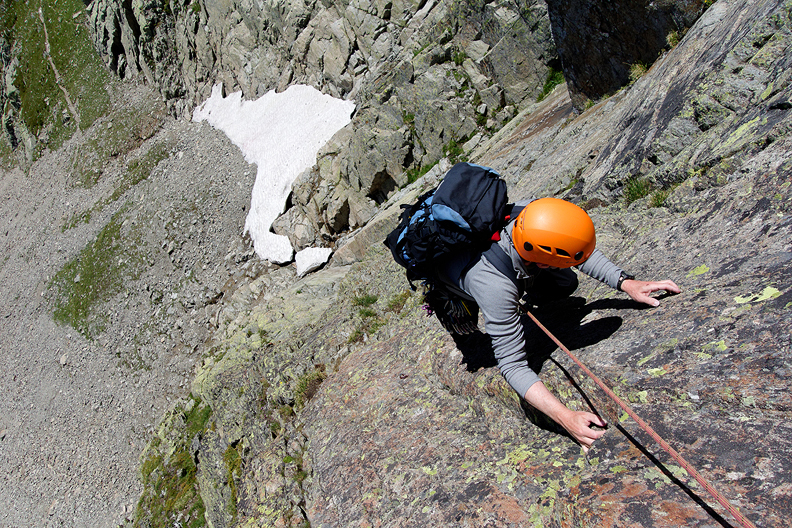 We though we would take a look at the Chevalier Couloir on the Petite Aiguille Verte. 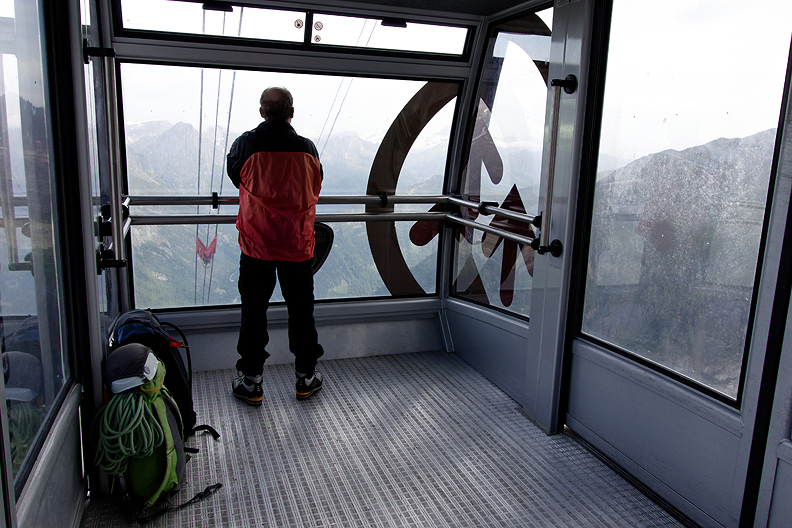 The lift even opened on time, with a few other parties out for the murky day. 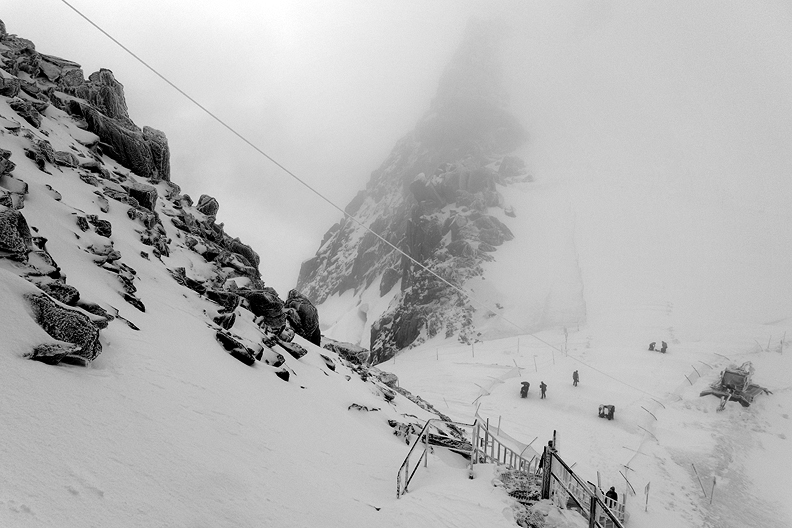 This is the view walking down the stairs of the Grands Montets, to the rope-up spot. Unfortunately, there was more new snow than we expected, and concern over avalanches turned us back before we had even gone 15 minutes. As it turned out, another party did get caught up in a slide on the normal route (nobody hurt, fortunately. 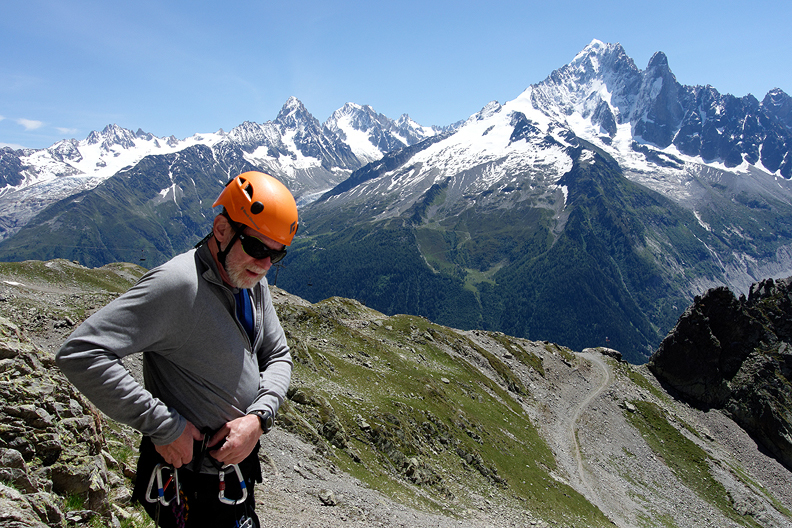 We retreated to the valley floor, had lunch and did a few good rock pitches at Les Gaillands, a nice, warm, "safe" crag only minutes from Chamonix. The next day, things were looking up a bit. 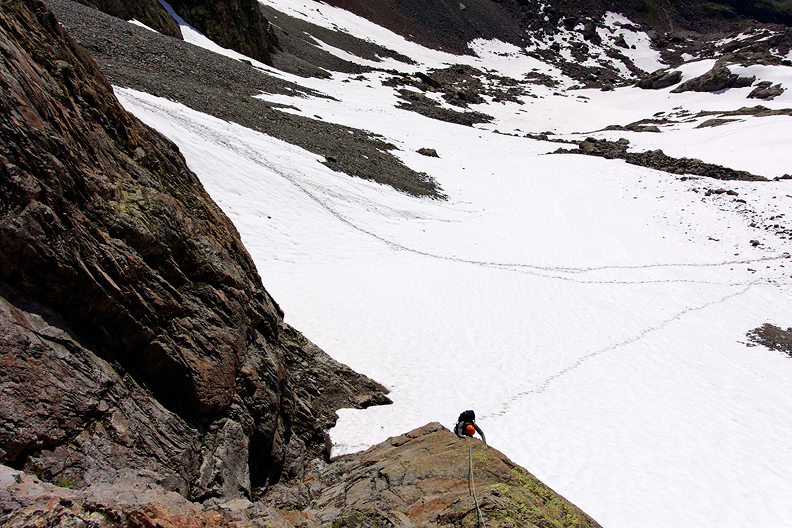 Wanting to give the new snow a chance to settle, we opted for a rock route in the Aiguilles Rouges. The Gaspard Premier on the Pointe Gaspard is one of the best routes of its grade in the Rouges, some 7 pitches, with several excellent 5b pitches on good rock to a nice summit. Mouse over to see the peak and line. 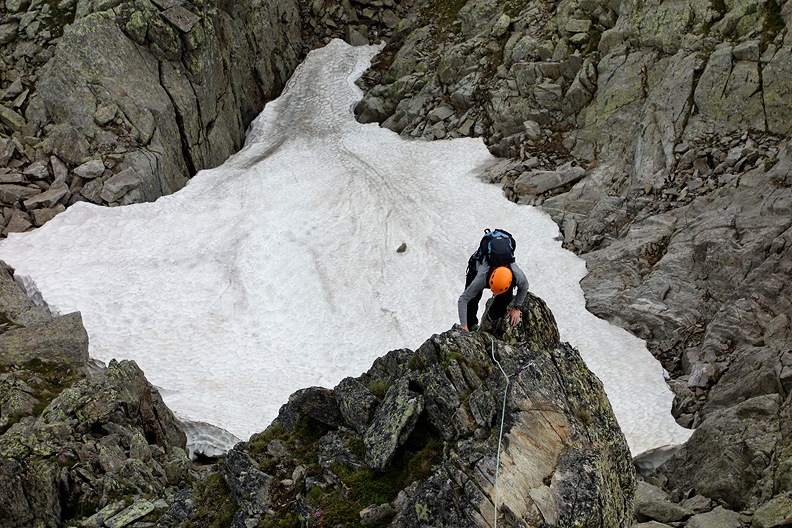 On the first pitch of Gaspard Premier. Looking up at the top 4 pitches. Roll over to see the line. 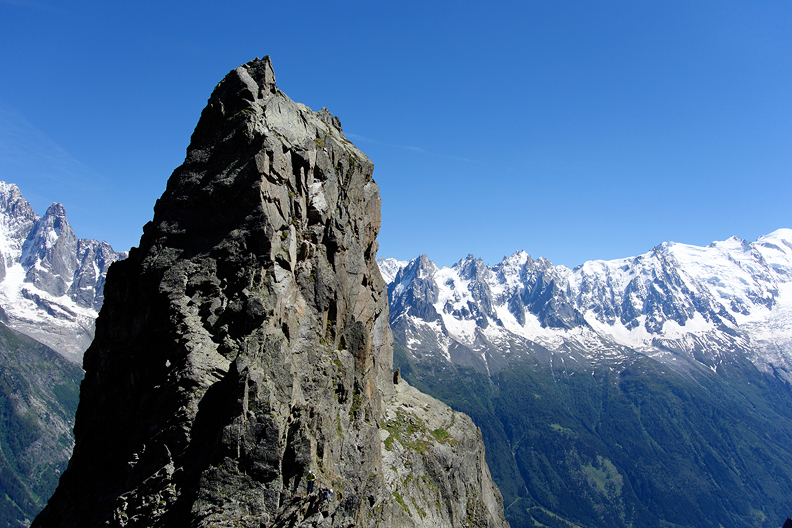 Looking across at the Aiguille Verte. 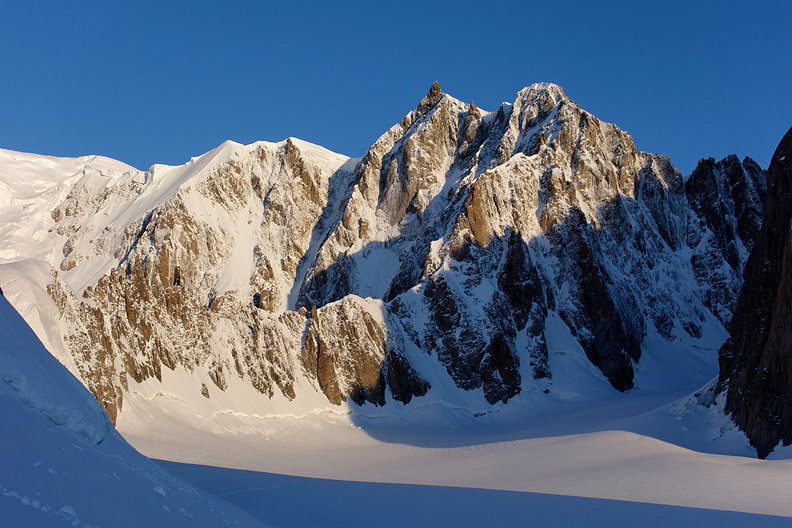 The Petite Aiguille Verte blends into the base of the ridge running down and left of the summit. 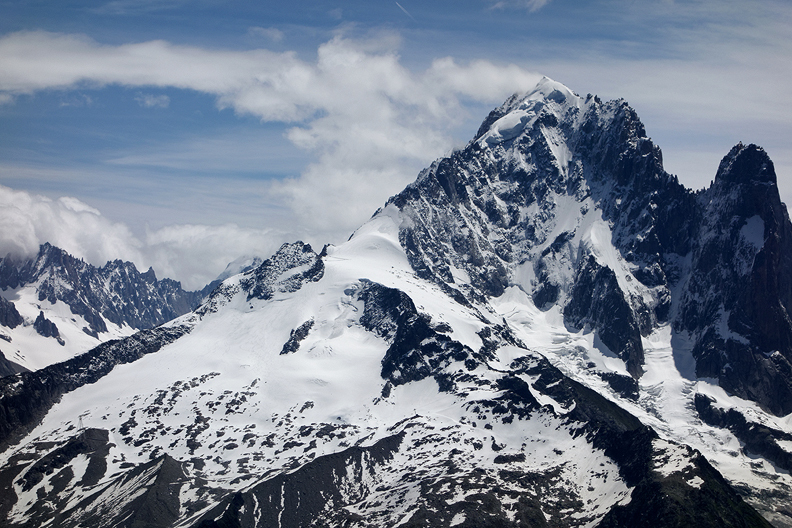 You can just make out the debris of the avalanche from the previous day. On the walk back to the Index lift after the climb. Still pretty windy up high, the sign of another incoming bit of nastiness. This photo, taken at sunrise on day 6, is more like it. The previous day, our day 5, had been generally quite bad with light rain almost the entire day. 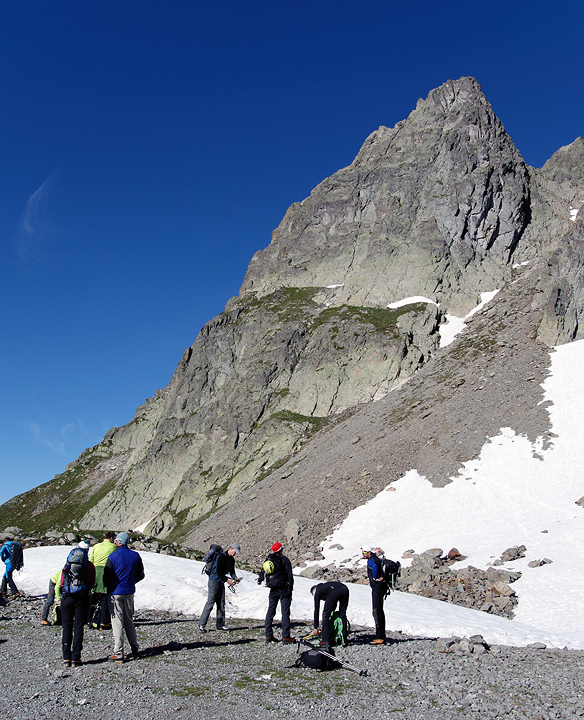 But, hoping to take advantage of the much better forecast for day 6, we moved up to the Torino hut with plans for the Gervasutti Couloir on the Tour Ronde on day 6. 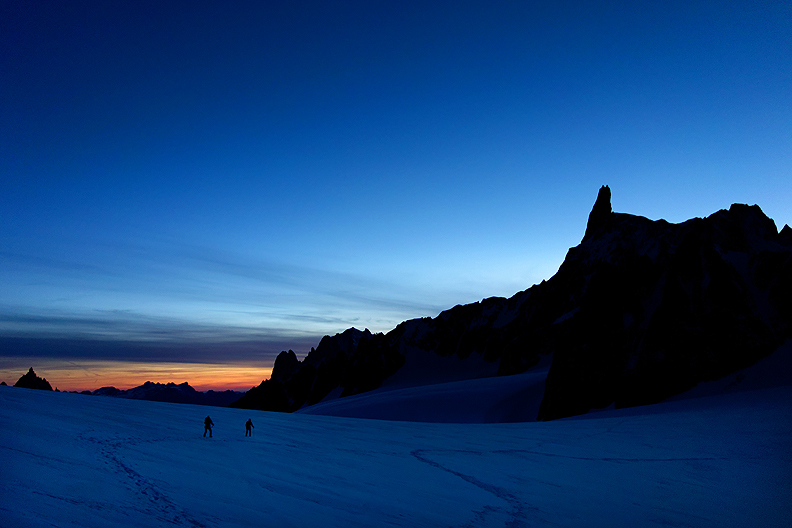 First light on the Tour Ronde. 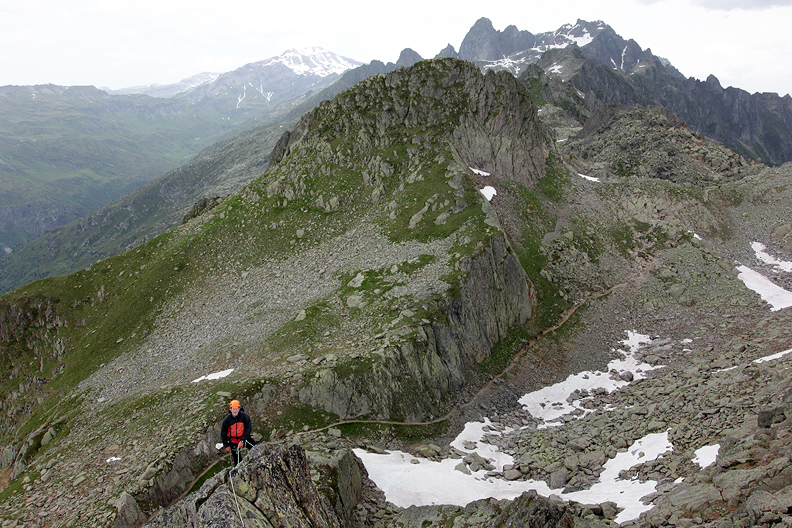 Our route, the Gervasutti, is not visible, around to the right. 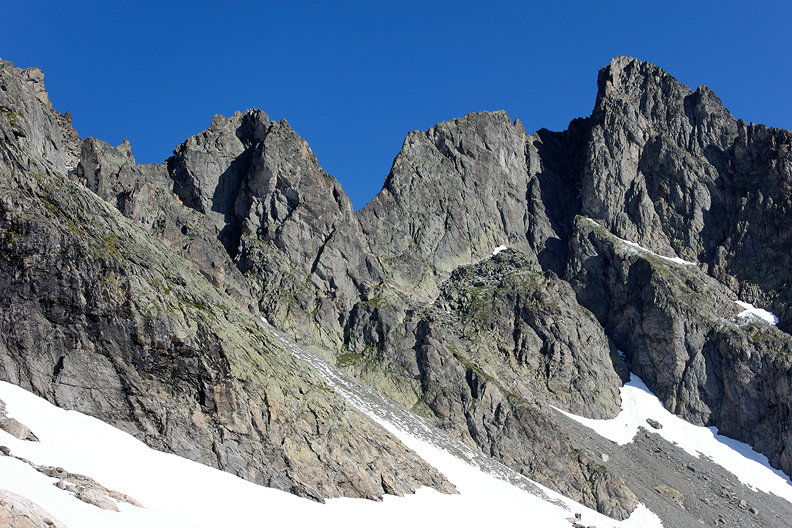 Mouse over to see the North Face route, which Norm climbed in 2007. 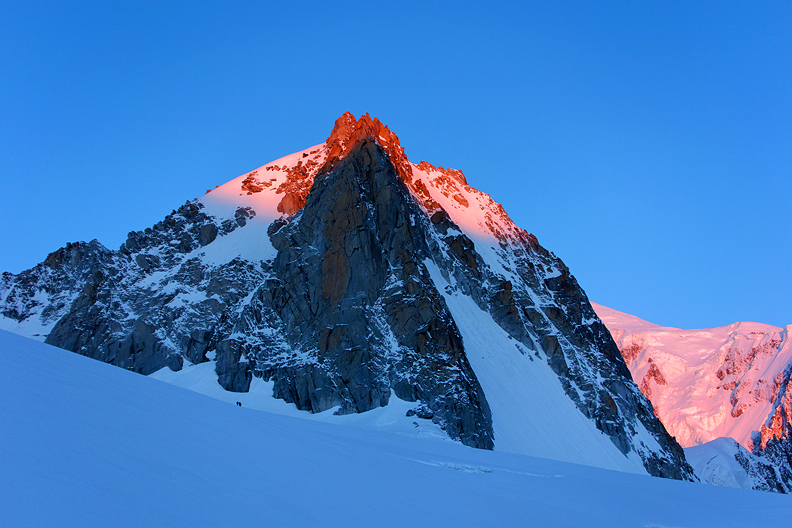 Sunrise with the Dent du Geant. 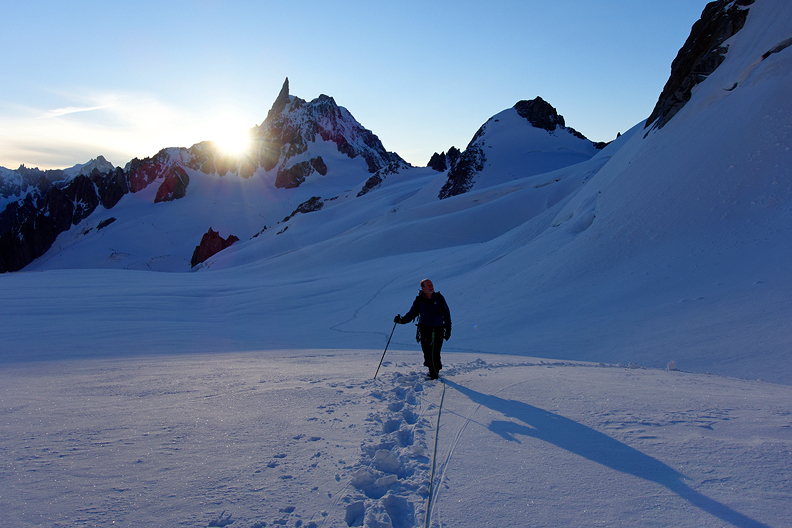 Still on the approach to the Couloir. Lots of deep new snow. Finally we get the full view of the lower part of our route. Unfortunately, we felt there was simply too much new snow, with a surprisingly weak layer some 20 cm down. Once again, "Discretion...", etc. Walking back to the lift. 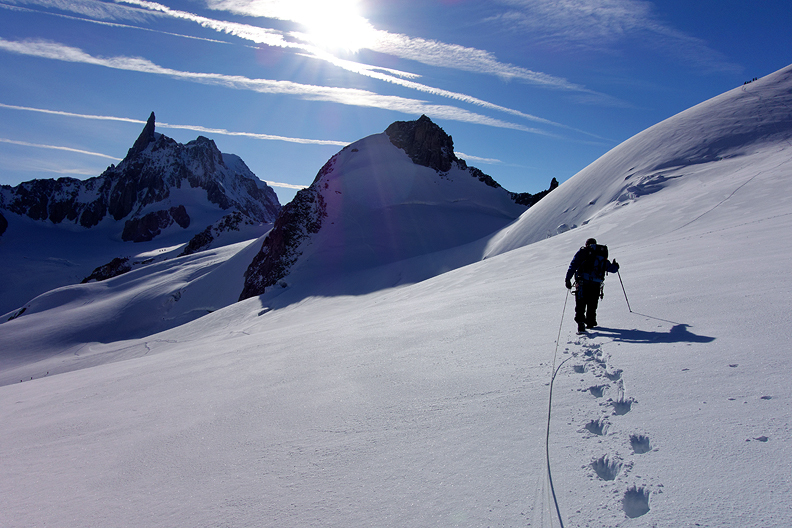 Not wanting to waste the sunniest day of the week, we headed back up the Index lift to the Aiguille de l'Index. Our route was the Brunat-Perroux. Mouse over to see, more or less, the line. Gearing up at the base. Perfect weather. The top of the first pitch. Looking back at the Index from the descent. The good weather was not to last. 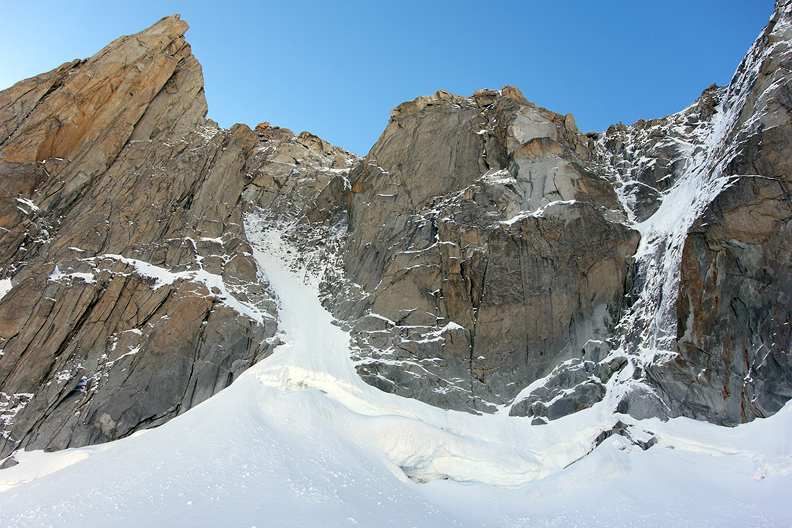 With one more day to climb, and a morning forecast to at least be more or less dry, we planned once again to try the Chevalier Couloir on the Petite Aiguiile Verte. 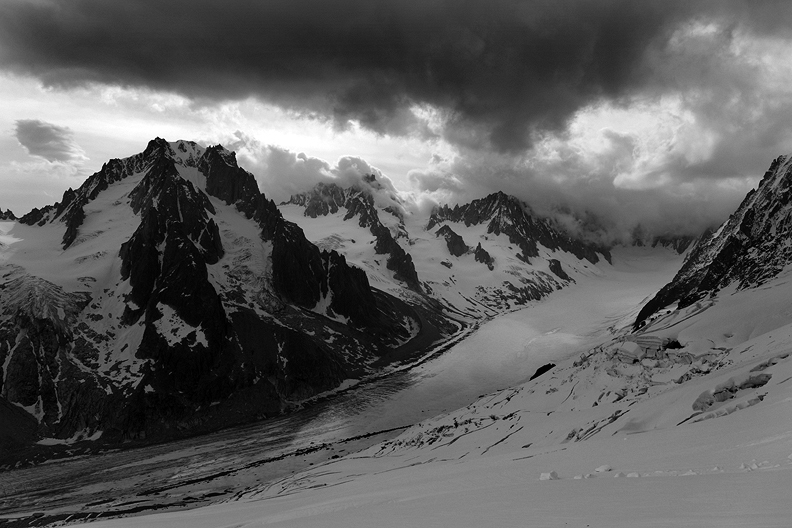 Here's the rather ominous view awaiting us from the glacier. Damn that "Discretion..." The snow was not frozen and was a deep sloppy mess. 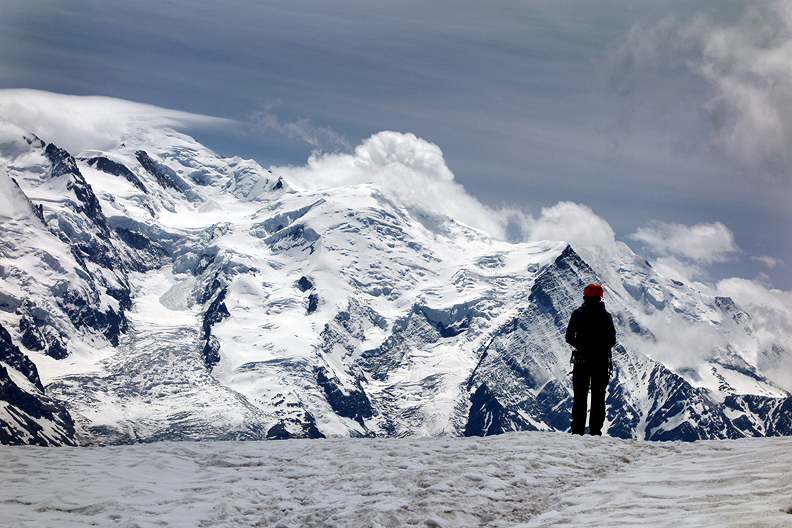 With no previous track and snow forecast for a noon arrival, we concluded that the ascent, once again, was ill-advised. So, somewhat discouraged, once again back down the valley. With the early descent and the rains seeming to hold off, we were back up in the Rouges for another (easy-to-escape-from) rock climb. This one is called Mic est Maousse. 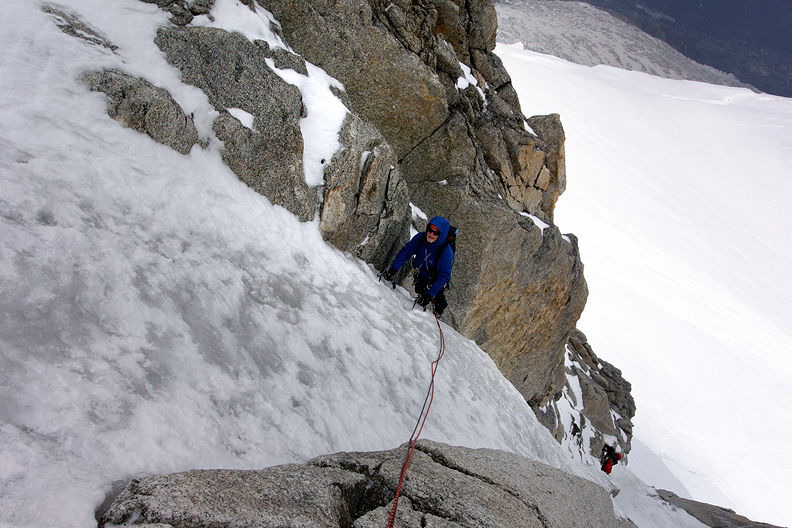 Norm on the third pitch. 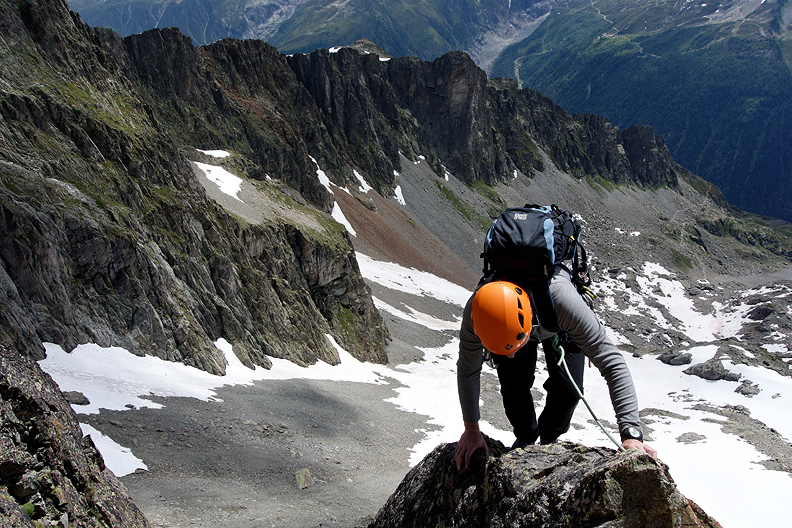 Climbing in the Aiguilles Rouge on Mic est Maousse.